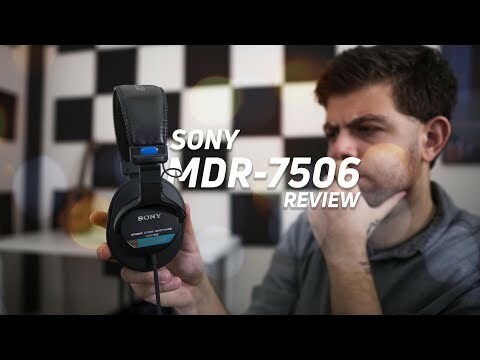 The Sony MDR-7506 headphones might not be the best for enjoying your brand new listening station, but there's a reason these are a standard when it comes to audio production and mixing. There are a few different scenarios when a pair of headphones become a “must-have” item. One instance is travel. Traveling with a pair of active noise-canceling cans is a must if you want any kind of peace and quiet. Then there’s exercise and more casual use cases where the quality of sound might not matter as much as the durability of the headphones. Then, of course, there’s the audiophile whose only concern is getting the best sound out of their equipment. But another category that people tend to ignore are those on the production side of things. And when it comes to audio production one pair of headphones have become all but an industry standard: the Sony MDR-7506 headphones. You’ll find them on the heads of people in recording studios, newsrooms, and video production crews. As someone who has been in recording studios and currently has a job where editing audio is a requirement, I figured I’d try them out. And although I did like them for work, there were some aspects that made them a little frustrating to use at times. But first, let’s talk about who should buy these. The MDR-7506 headphones have a plastic build with a are over-ear cans meant for production. Are the Sony MDR-7506 for you? The great thing about these (as you’ll see later in the video) is the sound quality that you get for the price. At only $79 these are great for any budding YouTuber on a tight budget or larger organizations that need to get their entire team a pair of cans. People who are going to be using these at a desk. Because of their long coiled cable and closed-back design, these make for a great office/studio buddy. But if you’re a commuter, the cable is a little too much of a hassle. Entirely made of plastic, the Sony MDR-7506 aren’t the most durable pair of headphones. Talking about the build quality of these headphones is a bit conflicting for me, because even though I like 80 percent of what they have to offer, that other 20 percent would just make these that much better. Let’s start with the obvious. These headphones are made almost entirely of plastic. This is great because it means they’re lightweight and don’t weigh you down while carrying them around, but it also means that they’re not all that durable. They come with a soft carrying case, but that isn’t enough to protect them if I throw them into a bag. More often than not, though, I just ended up throwing them into my bag and hoping for the best. On the bright side, these won’t cost an arm and a leg to replace, even if they do break, so there’s that. They also fold down into a more compact footprint, which is probably my favorite thing about these. Just pushing the ear cups toward the headband gives you a satisfying click that lets you know you’re good to go, and though it still doesn’t seem unbreakable, it becomes so much smaller that it’s super useful. The headphones don’t have any kind of plush memory foam padding, but they’re still sufficiently comfortable for getting the job done. True, they clamp down on the ears a little too hard, and the crown of my head felt like it was pinched during longer listening sessions. But neither of these issues were enough to make me take these off for relief. Still, if Sony would have just made the ear cups or padding a little more comfortable, I would have nothing to complain about. Luckily, I wasn’t the only one that felt this way, which has led to a thriving market on Amazon for replaceable ear pads with better padding. So if you do get these and want to go that extra mile, you have plenty of options. I had no problem driving these headphones with cell phones or even a tiny synthesizer. Now, I usually have a thing for all-black headphones with a minimal look to them, and these toe that line, but something about them stops me from really enjoying the design of these. It could be the wrinkles in the padding, or the fake leather stitching, or the heavy branding on both ear cups, but it’s most likely all of the above. All of that put together results in something that simply isn’t pleasing to the eye. To be fair though these came out a few decades ago, so maybe they were the epitome of design at the time. Now they just seem like boring, work headphones to me. The Sony MDR-7506’s can fold down to a more compact size (and they have a satisfying click while doing so). The cable is non-removable (so don’t break it), but it’s super thick and durable. It almost weighs the headphones down when you’re wearing them, but I kind of like that about them. It adds a nice heft that inspires confidence and makes them feel heavier and sturdier than something made of plastic. I will say that, while this was welcome while sitting at my desk, it was a bit of a hassle to use while out and about just because of how heavy and long the coiled cable is. How do you connect to them? The 3.5mm connector is the only way to connect these to anything, but they come with a 1/4″ adapter. Obviously, these aren’t Bluetooth, so there are no fancy codecs you have to worry about. These are a good ‘ol fashioned pair of cans that end in a gold-plated 3.5mm connector with threading on it to attach the included ¼” adapter for when you need to plug into something a little more substantial than a smartphone. Now, these do have an impedance of 63ohm, so any weaker smartphones might need a bit of a boost to power them. Granted, I had no problems while using an iPhone X (with dongle), Pixel 2 (with the freaking dongle), my Macbook Pro, or my OP-1 synthesizer. Each sufficiently drove the headphones and I didn’t have any issues. I said at the beginning that these are considered industry standards, and sure, their compact build has something to do with that, but it’s mainly because of the sound that the 40mm drivers pump out. 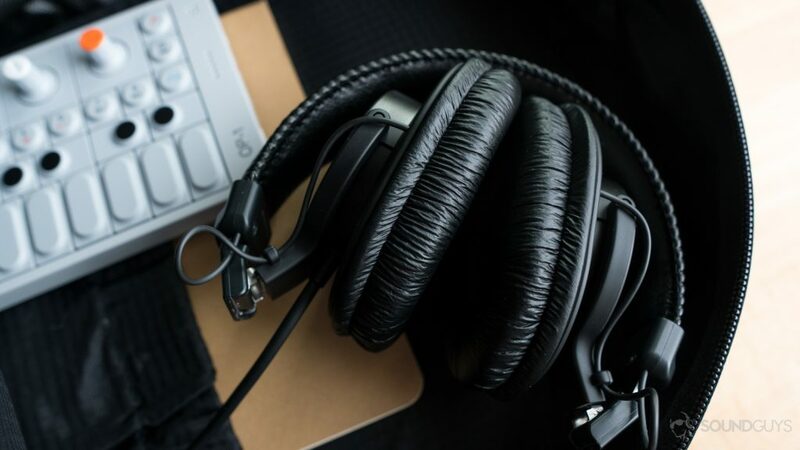 Now, when it comes to audio production, you’ll hear terms like “flat” and “neutral” thrown around a lot, and what this means, in a nutshell, is that the headphones can reproduce each frequency in the frequency range (in this case 10Hz – 20kHZ) at the same sound-pressure level. Sony made these for audio production, and they’re good at what they do. While that’s what most headphones meant for this kind of work aim to achieve, the Sony MDR-7506 excel at this. But they also emphasize a part of the frequency range that not many consumer headphones do, which is the mids and highs. It’s no secret that Beats headphones add a hefty amount of emphasis to lower notes, which results in a booming bass that consumers enjoy. 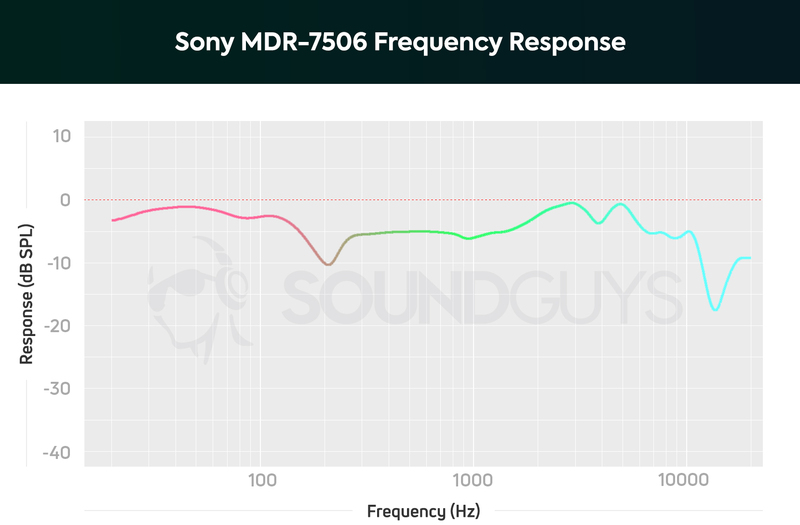 The frequency response of the Sony MDR-7506 does a good job of powering all parts of the frequency range equally. While the Sony MDR-7506 do a good job at blocking higher freuncies (like most over-ears), they struggle with low end notes which barely get blocked at all. However, the MDR-7506 go in the other direction. As you can see from the chart, the low end hugs a pretty flat line compared to other headphones making their bass response clear and easy to hear, though not as powerful as some consumers might be used to. They also slightly emphasize the mids and the highs, which can be both good and bad. Though they can reach as low as 10Hz, they don’t really do that great of a job bringing the bass to the forefront. I’m used to the thumping kicks in the song Girls by Slow Magic being front and center, but here they’re left in the background, while the rhythmic shake/claps that come in at 0:39 take center stage. Even with everything going on at this point in the song, you can still clearly hear the slight reverb added to the claps giving it a livened feel. This is also seen in the song Home Again by Michael Kiwanuka. The song starts out acoustically with just Michael’s vocals and his guitar driving everything forward, and in most headphones, the bass strings that he plucks 14 seconds into the song are immediately noticeable and (not to get too deep) add a sense of urgency to the track, forcing you to pay attention. Here those plucks don’t have the same impact; instead, his vocals are given prominence. This is all well and good for people who don’t want bass taking over a song; except it’s almost too much. At certain points in the song, you can hear some distortion and harshness creeping in. The Sony MDR-7506 headphones aren’t insanely comfortable but they get the job done. The Sony MDR-7506 fits snugly in a bag next to your other gear. The cable is 9.6 feet long, but it’s coiled so it can stretch to even further. The Sony MDR-7506 headphones profile, where each side is labeled with an L or R.
So you’re probably thinking, “If there is harshness and distortion, then why are they the industry standard?” Well, it’s actually the emphasized mids and highs that make these so great. You have to remember their intended purpose. They’re not for listening to music; though, you obviously can use them for that. These were made for production, and when producing, you want to make sure that whatever you’re mixing is going to sound clear to the listener. So if something sounds harsh to you on these headphones, you know that it’s definitely going to sound harsh on someone else’s headphones. Understanding that relationship can help you account for that in a mix. That’s what makes these so great for people recording live in the field or anyone editing in a studio. I recently edited a podcast with a pair of crummy in-ears while I was traveling, and it sounded fine to me—until I got home and listened with these. Every little flaw became immediately apparent. For anyone who needs the finished product to sound perfect and doesn’t want to spend thousands of dollars on a pair of reference headphones like the Sennheiser HD800, it’s easy to recommend these. So should you buy these? If you’re going to be producing, absolutely. They’re an industry standard for a reason.